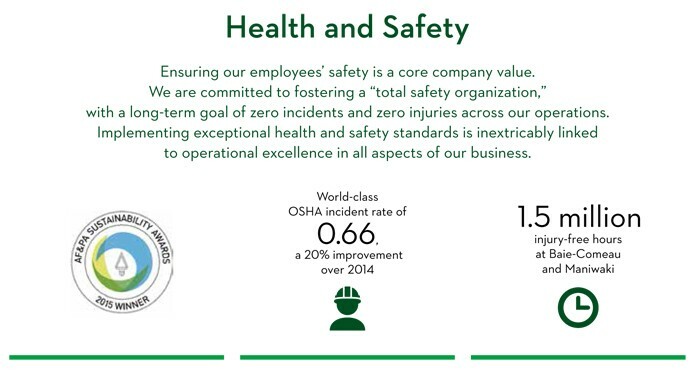 Our success reflects our employees’ focus on Resolute’s major objective of creating an injury-free workplace. We combine safety leadership with individual accountability, supported by a stringent safety management system that includes employee training and awareness, audits and monitoring, as well as employee participation through joint health and safety committees. Our proactive leadership and commitment to fostering a “total safety organization” – with zero incidents and zero injuries at all of our operations – has received numerous awards, including the American Forest & Paper Association’s Leadership in Sustainability Award for Safety, the Pulp and Paper International Award for Risk Management, and the International Business Award’s gold Stevie® in the Health, Safety & Environment Program of the Year category for both Canada and the U.S. Check out Resolute’s combined 2015 Annual Report for more information on our safety performance and other interesting #RFPfacts.